The multi-institution study, published Feb. 22 by the Journal of the American Medical Association (JAMA) Internal Medicine, found that there were record highs in domestic news coverage of HIV and in Google searches for information about HIV and HIV prevention soon after Sheen’s announcement. “Charlie Sheen’s disclosure was potentially the most significant domestic HIV prevention event ever,” said Mark Dredze, a Johns Hopkins researcher who has been a leader in the study of online data to monitor the spread of flu cases, mental illness trends and other health topics. 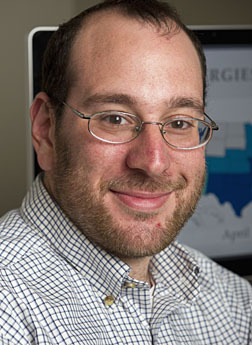 Dredze, an assistant research professor in the Whiting School of Engineering’s Department of Computer Science, is a coauthor of the new JAMA IM study. The researchers knew that the involvement of a celebrity often raises public awareness about a health issue. They wondered whether Sheen’s disclosure had shone a fresh spotlight on HIV, and in doing so produced an important public health benefit. To find out, the team turned to public archives for news media trends, using the Bloomberg Terminal and Google Trends to collect data describing HIV and HIV prevention engagement since 2004. Focusing on the hours after Sheen’s disclosure, the team monitored news reports mentioning HIV and Google searches originating from the United States and sorted into four categories: HIV (all searches with “HIV”), condoms (all searches with “condom” or “condoms”), HIV symptomology (all searches with “symptom,” “symptoms” or “signs of” and “HIV”), and HIV testing (all searches with “test,” “tests,” or “testing” and “HIV”). Sheen’s disclosure also corresponded with the greatest number of HIV-related Google searches ever recorded in the United States on a single day, Ayers said. About 2.75 million more Google searches than expected, based on previous trends, included the term HIV on the day of Sheen’s disclosure, with 1.25 million more searches than expected including terms for condoms, HIV symptoms, or HIV testing; after adjusting for changes in overall search volume and historic trends. In relative terms, all HIV searches were 417 percent higher than expected the day of Sheen’s disclosure. Condom searches (such as “buy condoms”) increased 75 percent. HIV symptom (such as “signs of HIV”) and HIV testing (such as “find HIV testing”) searches increased 540 and 214 percent, respectively, the day of Sheen’s disclosure and remained higher for three days. Still, the team members say that Sheen’s disclosure has already produced tremendous public health benefits. “More must be done to make the ‘Charlie Sheen Effect’ larger and lasting,” Ayers said. Also contributing to the research were Eric C. Leas of the University of California, San Diego, School of Medicine; and Seth M. Noar of the School of Media and Journalism, University of North Carolina, Chapel Hill. Dredze worked on the study during a sabbatical term at Bloomberg LP.